Suzanne Rozdeba The sign from last week, alongside this week’s new name. First it was Bea’s Cafe, now it’s La Betola. On Thursday The Local noted that Bea’s Cafe was coming to 514 East Sixth Street, a building with a controversial rooftop extension that is owned by Benjamin Shaoul. 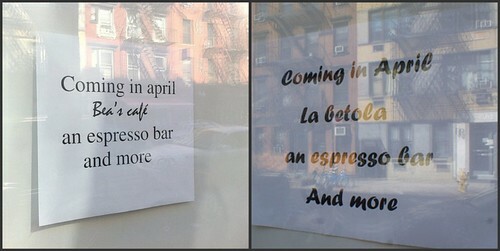 Now, a new sign in the window says that the cafe will be called La Betola. The concept hasn’t changed, apparently: the sign still advertises “an espresso bar and more.” Anyone have a clue to the story behind this cafe crisis that’s piqued our interest almost as much as the mysterious messages on East Seventh Street?